the tree that sends out spoils of memory, all beginning October end. Its overwhelming hold on all things childhood, love, adolescence, longing, hide and seek, Diwali before it’s lit, endless drives and old monk, as well as full-sleeve shirts, the ‘winter smell’ needed me find it a name, this ball of small white flowers which crumbled in my hand when I plucked it off a tree in Lutyen’s because I’d tugged at it too hard, in excitement. I've grown up married and settled down with a loving son. Few days back I was walking down the lanes inside the JNU campus. We're in the final stage of autumn and to me the stinging fragrance of the flowers of Alstonia scholaris (commonly known as Indian Devil tree or Pala tree or Milky pine) reminded me that winter is not far away. Humid days shall be over and colourful Christmas shall embrace us soon. Thick mysterious fog will envelope as if challenging us mortals to unravel the secret of life and how warm relationships can thaw away the cold of the winter. These thoughts and the fragrance of Alstonia scholaris took me back to my childhood days. How we used to smell the inaphis and grandma’s connection of a particular smell to Christmas. The smell lingers just as we fondly remember the odors of our loved ones. Travelling back home after work these days has become much more pleasant. The lime like heady scent of the Saton (Alstonia scholaris) fills the air at dusk. The flowers bloom at dusk in bunches and one can see carpets of flowers on beaten tracks and tar roads wherever the tree flowers. Flowering in sync almost throughout the state, one can virtually count the number of trees from the fragrance that fills the air, if one is on a long distance drive. The flowering of the tree also heralds the arrival of the winter. It flowers twice during this time. The generic name ‘Alstonia’ is attributed to the distinguished botanist Prof. C. Alston of Edinburgh and species name ‘scholaris’ is derived from fact that its wood was used for making wooden slates for school children. The tree grows to an average height of 20 metres and the branches tend to spread out like an umbrella. The leaves come out in whorls of seven, hence the name ezhilam pala in Malayalam and ‘Sapthaparni’ in Sanskrit. 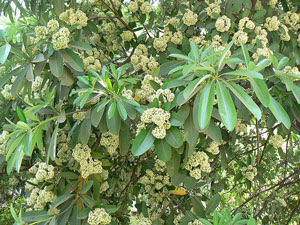 The scented small tubular sessile greenish white flowers bloom in dense terminal clusters. The fruit of the tree reminds one of a drumstick. Long and narrow, it hangs down in pairs. During summer as the tree bears fruit, the tree resembles a woman with her tress hanging loose. 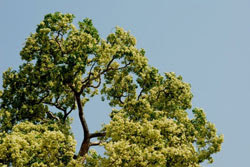 According to folklore, the tree is believed to be an abode for evil spirits due to its scented night blooms. However, the scent is to attract night pollinators and has nothing to do with guarding evil spirits. The elegant umbrella-like spreading tree is a popular ornamental avenue tree as it provides shade. The tree is said to have medicinal values. But I don't get the evil spirits. Wouldn't a lovely night-time fragrance be the doing of beautiful, seductive spirits? I had never heard of 'an olfactory psychologist' before but it actually makes eminent sense. Smells (bad word) Fragrances (better) are to me the most powerful memory KICKERS. It is not strange that I post a comment in the month of October about Alstonia Scholaris. I now live in Pune in Western India and the fragrance of the tree came wafting on the night breeze and it took me back at Warp 9 to a Round-about in Chanakyapuri in New Delhi which I drove past from my office to my home, usually late evening. An evocative, heady fragrance indeed which flashed past and I could never understand why I could not smell it round the year. I used to sniff the air when ever I passed the place but nothing. Once 'nosed' impossible to forget the fragrance of Peace and Contentment. What a great comment. I've never been to India and now I want to go, if only to inhale the A. scholaris one evening on a roundabout in New Delhi. I'm an American who has spent the last six years living in New Delhi, and I've always found the smell of this tree quite offensive. I find the scent overwhelmingly pungent, and it smells a a lot like hospitals in the US do. It seems that most people here in India like it (it's also a childhood smell for a lot of people). I've been told a few don't (and those who don't, REALLY don't). Could you please explain why it is that there are certain scents that people either love or hate? And has anyone postulated that there "supersmellers"in the way that there are "supertasters"? So A. scholaris doesn't send everyone into sentimental raptures. Interesting. I'd love to know the tree's key aroma molecules, so we could search for lovers & haters. There are precedents: androstenone can't be smelled by a lot of people; others find it musky; still others thinks it reeks like bad urine. On the culinary side, cilantro is flavor/aroma that polarizes people to a remarkable degree. The working hypothesis is that these singular, distinctive reactions to specific compounds are genetic: the result of a variant odor receptor genes or variant wiring of same to the brain. Not a satisfying explanation at this point, but various labs are working on it. There is plenty of Alstonia fragrance right now in Punjab Agricultural University, Ludhiana Punjab India. There are many alstonia trees in my college campus almost 2-3 years old.I haven't seen its flowers. How old should be an alstonia tree to flower?